From mineral samples to animal or plant cells, a microscope is an instrument used to view objects that are too small for the naked eye to see. The microscope is a highly important instrument with a wide range of applications. It allows scientists and students to study a range of microorganisms, cells and structures, playing an integral role in both research and diagnostics. 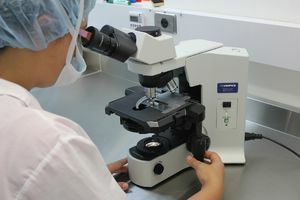 While the complexities of different stages of education or research require instruments with differing levels of sophistication, microscopes can be used in a variety of settings, providing an invaluable teaching tool. Whatever the instrument type, maintaining your laboratory equipment is of paramount importance. Proper care and maintenance of your microscope can extend its life by many years. Take a look at our top tips to keep your laboratory microscopes in tip top condition. Improper handling is a common cause of many problems that occur with microscopes. When carrying a microscope, hold it by the base and the metal support arm. The stage on a microscope is the flat plate where the slides are placed for observation. Avoid picking your microscope up by the stage or the eyepiece holder, as this can cause misalignment. When using your microscope, the objective lens is lowered to adjust the focus. However, be careful not to let the lens touch the slide you’re looking at, as this can damage the lens. Furthermore, dirty lenses are notoriously difficult to clean. Microscopes should always be sold with dust covers. Whether transporting or storing your instrument, make the most of the microscope bag and remember to keep your microscope covered when not in use. The microscope’s eye tubes also need to be kept dust free. If the eyepieces need to be removed, cover the tubes with caps and store them with the microscope. Ensure you store your microscope in a clean, dry space with good ventilation. Salt air or damp, for example, can cause damage to equipment over time. Expensive, precision equipment should not be stored next to solutions that may leak. Similarly, keep your microscope away from areas with potentially corrosive chemical fumes. Such fumes can destroy lenses or corrode metal parts. Oil immersion is a technique used to increase the resolving power of a microscope. Both the objective lens and sample are immersed in a transparent oil of high refractive index so that high magnifications can be achieved while still maintaining good resolution. It is essential to ensure careful cleaning takes place immediately after using immersion oil and do not use damaging solvents. After using your microscope, turn off the illuminator and wait for it to cool down before putting it away. Allowing the bulb to cool will extend its life and avoid the unnecessary cost of expensive replacements. Similarly, if used constantly on full power, the bulb will overheat and blow. Remember too, to turn the illuminator off when not in use. Microscope lenses are delicate. Treat them carefully to avoid any scratches. Use an aspirator to remove dust. Moisten special lens paper with distilled water or appropriate cleaning solution. Rubbing gently in a circular motion will remove any sticky residue. Never use anything abrasive on microscope lenses. Your microscope should be sold with a user’s manual and specialist spanners as required. Always refer to the manual when making any adjustments to the microscope and use the supplied spanners. Never use force, inappropriate tools or over-tighten when making adjustments to your microscope, as this will only result in equipment damage. An annual maintenance check of microscopes is always a good idea. Moving parts should be cleaned and lubricated. Similarly, inspect the power cords and plugs for safety. Contact Edulab’s friendly team today for a range of products to help keep your laboratory microscopy equipment in tip top condition.